Hunter 53091 Builder Deluxe Fan with Blades and Light Kit - 52"
Home > Home Improvement > Fans > All Ceiling Fans > Hunter 53091 Builder Deluxe Fan with Blades and Light Kit - 52"
For a classically designed fan with a sleek modern twist, check out Hunter's Builder Deluxe Fan with Fan Blades and a Light Kit. 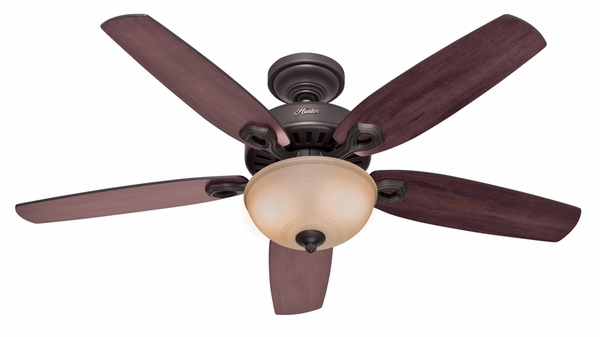 The 52 inch Builder Deluxe Ceiling Fan comes in your choice of new bronze, brushed nickel, or white finishes. Crafted with premium quality materials, the Builder Deluxe Ceiling Fan is for use indoors, and can be mounted flush, standard or angled. 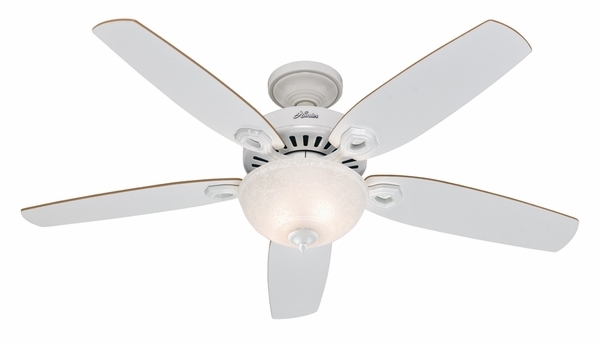 This ceiling fan includes a three-speed Whisper Wind motor, and can be used in rooms up to 400 sq. ft. in size. 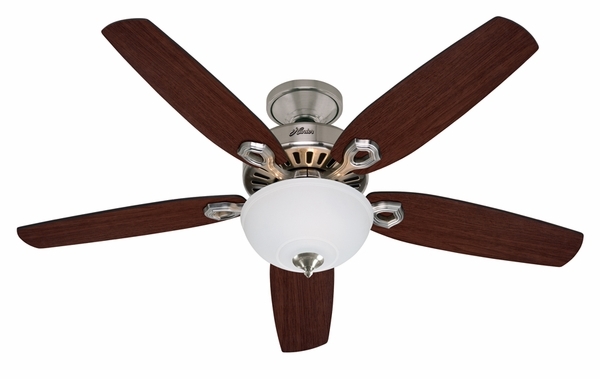 The five fan blades are reversible in beautiful Brazilian Cherry and refined Stained Oak. What is the distance from the top of the fan to the bottom of the light? The distance from the top of the fan to the bottom of the light is 17.7 inches according to the manufacturer. The pull chain adds eight inches. How much light does this give? What wattage bulbs are used? The amount of light produced will vary greatly upon the bulbs installed. The fan includes (2) candelabra style 60 watt incandescent bulbs. But, bulbs with a lower wattage could also be installed, but higher wattage bulbs should not be used.